Podcasting is a powerful new communications medium that could help you get your music out to the masses – and it's accessible to pretty much anyone with a home studio and a broadband Internet connection. Few people will have failed to notice that Podcasting is the latest tech buzzword. Everyone from independent musicians to political commentators is developing podcasts, the Internet-based equivalent of traditional radio broadcasts. Some people have even suggested that podcasting will eventually destroy the latter. But what exactly is podcasting, and why does it have such power? 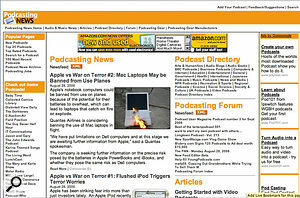 Reduced to essentials, a podcast (named from a combination of 'broadcast' and 'iPod') is a downloadable audio file that may be played via any digital audio-capable computer or portable music player, not just Apple's iPod-brand devices. As a podcast is essentially only an audio file (usually an MP3), anyone with a microphone and some simple recording software can create their own content. As a result, there are thousands of podcast programs available, covering everything from political commentary to tips for basket weavers. 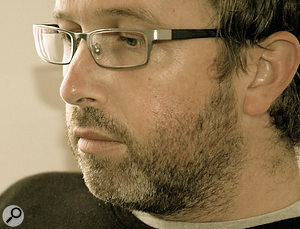 A lack of regulation regarding indecency, content and distribution for these shows has allowed a considerable degree of artistic freedom, and podcasts have promoted everything from underground bands with raunchy lyrics to democratic speech in countries where the traditional media are government-controlled. Podcasting has also been used to distribute educational lectures, technical-support tips and religious inspirational messages (also referred to as 'Godcasting'!). 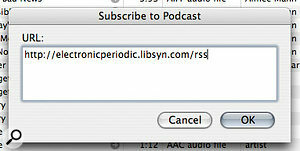 Subscribing to a podcast can be as simple as typing in a URL, as shown here with iTunes. Obviously, the ability to record, distribute and download audio files such as MP3s has been around for years. What makes podcasting different is a more recent technology called RSS (Really Simple Syndication), which enables a type of subscription service for podcast shows. A newer, updated and more flexible version of HTML (the basic language that makes up most web sites), called Extensible Markup Language, or XML, provides the basis for RSS, which can be used for basic text or can include files such as pictures and audio. 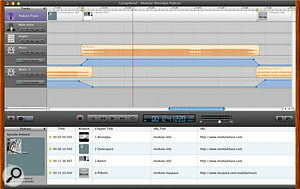 Podcasting is the process of delivering an audio file in an RSS file or 'feed'. This sounds moderately technical, but the process for the listener is quite simple and provides a continually updated stream of content. 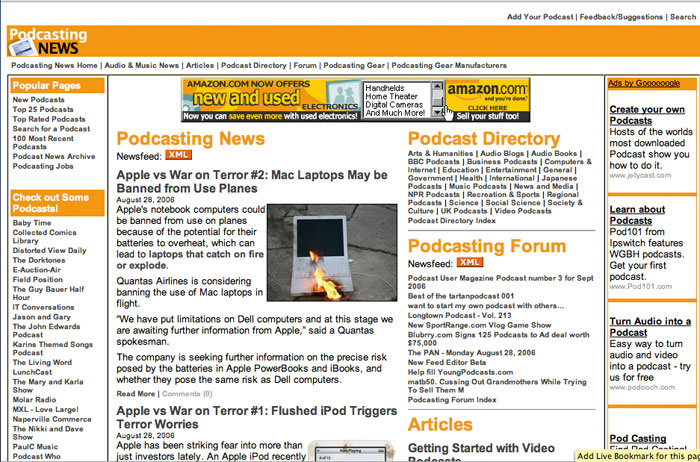 A listener chooses to subscribe to your podcast with an RSS 'feed reader' (also called an aggregator). Subscribing is as simple as copying and pasting the URL of the RSS file into the aggregator program. The RSS file contains all the links for downloading the audio, information about the author and which shows are available, and the aggregator program uses it to automate the subscription process. As an example, in Apple's iTunes software, go to the Advanced menu and select 'Subscribe to Podcast'. Copy and paste the URL for the RSS file into the box provided and iTunes will handle the finding and downloading of the series of audio files for that show. 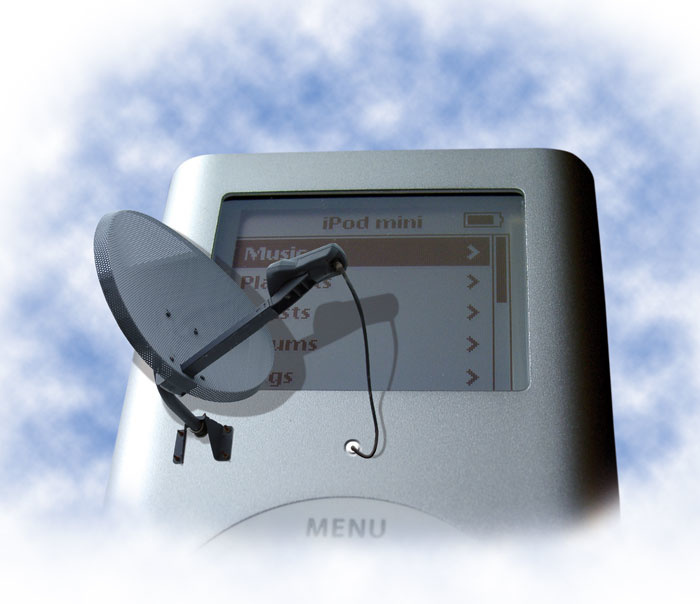 In some cases, the aggregator software also syncs those files to a portable player (sometimes referred to as 'podcatching'). Like the automatic software update programs you may already use, such as Windows Update, an aggregator application can check for new content regularly and schedule downloads depending on your type of Internet connection. The podcaster determines how frequently new content is available. Most shows publish new episodes once a week, but daily, monthly or 'ad hoc' shows are possible. The aggregator programs of listeners will check in periodically (depending on their users' settings) to see if there's a new show. All the podcaster needs to do is upload the show audio with the RSS file and it will be 'live'. Older shows also remain available to listeners as long as the podcaster keeps the audio and RSS files available on their server. Keeping a couple of older shows is a bonus to new subscribers, who can download these older shows along with the latest creation when they subscribe. One of this system's best and most powerful features is the ease with which a subscriber can download new content, via the aggregator. A subscriber will receive, like a customised magazine, the content they want automatically and pretty much effortlessly; this makes it easy for podcast creators to consistently reach and expand a targeted group of listeners. Creating your own podcast can be as straightforward as speaking into a mic and recording the result, or as complex as any large music album project. In terms of gear, it's possible to get started very inexpensively, as you probably already have the necessary elements in your studio: a microphone, computer, and some recording and editing software (see the 'Roll Your Own' box for more information). The most important elements of podcasting don't involve gear, though; they're the hosts, guests and other 'talking heads' that will commonly be the featured element of your show. A portable digital recorder such as Edirol's new R09 can allow podcast creators to incorporate field recordings made at live events, gigs and so on, into their podcasts. If you want to include guests who can't make it to your studio, phone interviews are a possibility. Anyone with access to a phone line or broadband Internet connection can be a potential interview target. The simplest way to add these remotely located guests is through a broadband Internet connection. 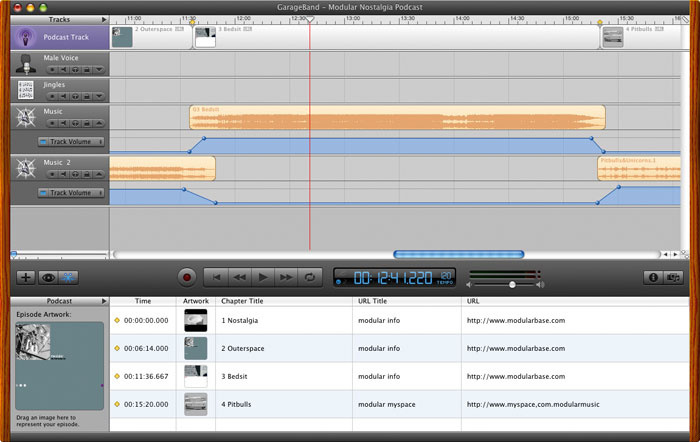 Using a simple application such as Cycling '74's Soundflower with iChat and GarageBand, you can record your audio iChat conversations with guests around the world. This method has limited audio fidelity and can be prone to service glitches or delays, but can be an excellent (and free) way to get started. For the really serious podcaster, adding a Phone Hybrid to your studio provides a more direct connection to the guest caller. Phone Hybrids, such as Telos Systems' ONE, are devices that directly connect typical audio gear to an analogue phone line, to give two-way communication. These devices provide a proper interface to the phone line while also conditioning the phone audio for your mixer or soundcard audio inputs. Some Hybrids also use internal digital processing to automatically control gain and EQ, making them especially suited to maximising the sound quality of analogue phone lines. Another way to bring the world into your studio is with a portable digital recorder. Is there an important person you'd like to interview face to face? Are you going to a special event? Take your listeners with you. 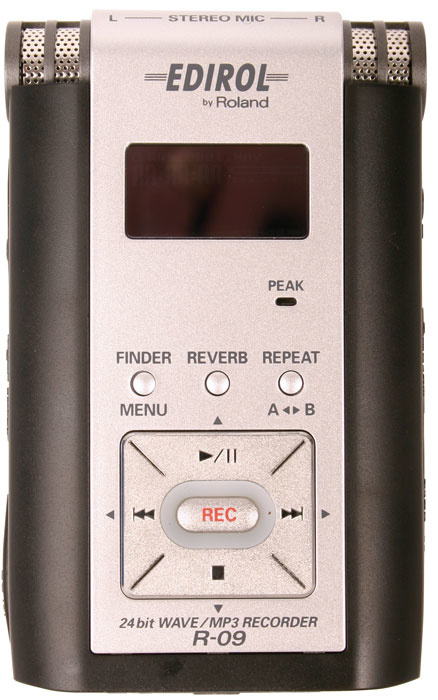 Portable digital recorders such as the Marantz line of compact flash devices, M-Audio Microtrack, Edirol R1 and new R09, Sony HMD Minidisc, PCM D1, and others include the mic preamps, level controls, recording and monitoring features needed for a studio on the go. 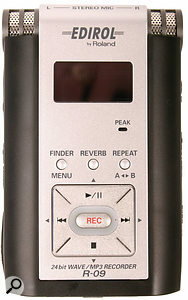 Most portable recorders can easily transfer the audio files straight into your personal computer later for editing and mixing, usually via USB 2.0, or by transferring the Flash card's contents via a card reader. 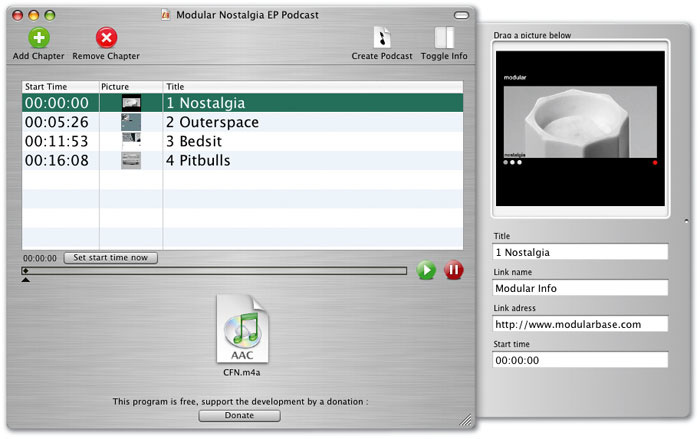 Some can even record directly in the MP3 file format for even easier integration into a podcast. Music has always been a key component in radio, and you'll probably consider it an essential part of your podcast. Unlike streaming audio, which does not create a permanent copy of a file on your computer, podcasts do create a 'real' downloaded copy. If you create your own recordings and content, as the copyright holder you can podcast that show without a problem, but using other music complicates podcasts, because you must obtain rights to use the recording for downloadable copies, not just streaming. As copyright laws vary in different countries, you have to check with every copyright holder to obtain permission to use their songs or recordings in your podcast. Some performing rights societies have developed new rules and fees for song licensing for podcasters, but most record companies that hold the copyright to the actual sound recordings have not. Fortunately, as a reader of Sound On Sound it's very likely that you'll be keen to use your own music and/or that of friends and collaborators, thus avoiding copyright issues altogether. The other way of avoiding copyright issues is to use 'royalty-free' music, but keep in mind that not all such music includes the right to distribute downloadable copies: some licenses include only broadcast or streaming rights. For anyone new to music creation, Apple's GarageBand and Sony's variations on Acid (such as Acid Studio) are an easy way of creating music for podcasts. GarageBand includes thousands of royalty-free loops that you can freely use. For starters, create your own theme music and audio 'logos' to identify and introduce your show. You can also use short segments of music to introduce new topics or segments. Listen to radio shows you like and take note of the many ways they incorporate music as introductions, transitions to new topics and for adding emotional impact or atmosphere. 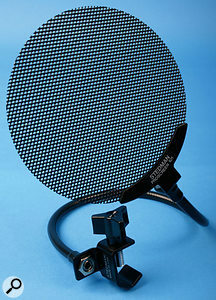 Once you've collected your equipment, it's time to get to work... We all know you need a pop shield for recording sung vocals, but don't forget they're essential for speech recording too. 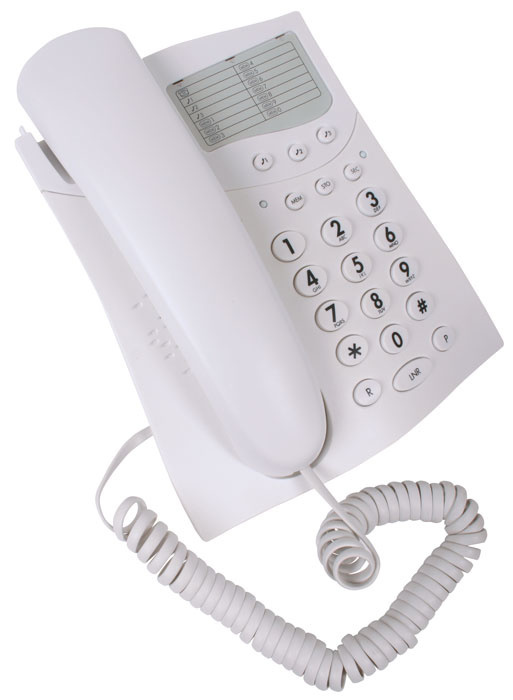 For phone interviews, a traditional corded telephone will provide the best voice quality. Make sure you use a pop screen on all your host and guest microphones. Before undertaking an interview, set up levels carefully for each participant. If you notice any distracting 'plosives' when your guests are talking (usually on words containing 'P's or 'B's), try angling the microphone so that the speaker talks across the microphone rather than directly at its centre. You can try moving the guest back an inch or so from the mic, too, and/or adjusting the position of the pop screen. Also consider using a little compression or limiting, because if a discussion gets lively you'll very quickly notice the large disparity between the level of normal speech and that of louder speech and laughter. Find good-quality telephones. If you're adding phone interviews to your show, try to get the best phone line possible. You may never really have listened to different headsets and phone lines, but there are vast differences in sound quality, so liaise with your guests in advance. If available, the best-sounding phone is usually an older-style, hand-held, corded phone. These tend to provide the most intelligible voice sound. Headset phone mics, phones in 'speaker' mode, cordless phones and mobile phones should be avoided, or at least used only as a last resort. Discover the art of the Tape Sync: Tape Sync is a radio technique used to get a good recording of a host and guests who are in different locations. While phone interviews can bring guests to your studio, a Tape Sync can give you a studio-quality recording of both sides without the need for the expensive, specialised equipment found in broadcast studios. You'll need a good quality microphone and a computer or portable recorder at both ends of the conversation. In addition, you'll need a Phone Hybrid at the studio and a good phone at the guest end. On the studio side, record both the phone audio and your own host audio on two separate tracks. Your guest will record only his/her own voice in one track. The guest then speaks into the microphone and at the same time holds up the phone handset to listen to the host and provide audio to the studio down the phone line. Bring the three tracks you have generated at both ends of the conversation together in your audio editor: you should have one track of your host, one phone track of your guest and one track of your guest's microphone. Line up the two guests tracks in your editor so that the tracks are synchronised (asking the guest for a '3, 2, 1' count-in at the beginning of the recording can help you find the correct spot). Now simply eliminate or mute the phone guest sound. Mix your host voice with your new guest microphone sound and you're done: you have a better sounding recording of both voices, without the mess of phone noise. What's your podcast all about? "Electronic music mixes. It's a place for electronic music composers signed or unsigned to submit their creations. By adding to the playlists, Electronic Periodic offers exposure to thousands of subscribers." When did you get the idea for Electronic Periodic, and how? "I've been podcasting for over a year and a half, but the idea goes back some years, to when I was finishing work late and picking up random pirate stations on the drive home. Credit has to go to the guys who set up these stations, despite all the legal ramifications, just so they can get the music that they enjoy out to their listening community. "Also, touring in the US, I listened to public and college radio stations such as NPR and KCRW, which had very eclectic playlists. One minute you could be listening to the Bee Gees, the next Aphex Twin. It seemed like the DJ was actually running through his record collection live on air. "In a way, podcasting gives a similar opportunity to the podcaster as a pirate station but without the risks of getting your equipment seized, or being fined and shut down by OFCOM. Electronic music seems to get very little airplay, and I decided to create an avenue for people who want to hear it. It's the music that I'm into, so it seemed like a natural thing to do." What form does Electronic Periodic take? "Each show, or 'element' is approximately 30 minutes in length and consists of various tunes submitted by listeners, mixed together as a continuous AAC file. The AAC format allows chapter selection and lets you skip between tracks, include artwork and embed web links for band information." Can you talk us through the making of a typical episode? "I start with the music selection process, listening to the tunes submitted, creating playlists on my iPod using the 'On-The-Go' function. Then I choose a running order for the mix. 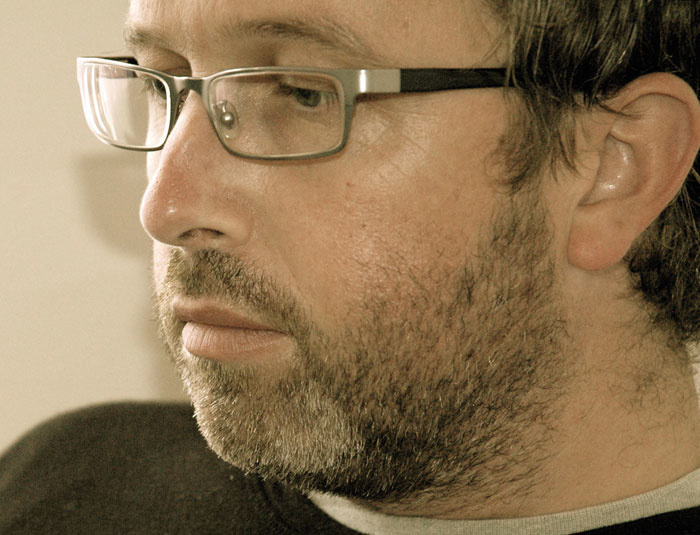 "I use Ableton Live to compile the shows, mainly because of its very flexible beat-matching and mix automation. Once the voice-over has been added, the mix is mastered via iZotope's Ozone 3 plug-in and rendered to AIFF format. The iTunes software is used to convert the master file to AAC format, then Chapter Tool Me software takes care of the chapter-selection process. "Once the show file is finished, it's uploaded to Liberated Syndication, a podcast host where all info and ID tags are added and the RSS feed updated with the various podcatcher sites. I use an Apple Powerbook G4 for most of the work, which keeps the whole process mobile." How did you launch Electronic Periodic, and has it done well? "I didn't do a launch in the traditional sense of marketing or advertising. I made manual submissions of the RSS feed for EP to the various podcatcher sites, and downloads started to show almost immediately. When the feed was added to iTunes, activity just went through the roof. In the first few weeks of Apple's new addition to the iTunes menu, EP was well into the top 100. People who wanted to find electronic music did. To date there have been over half a million downloads." Where can it be found, and do you now have an established listener base? Has anyone interesting contacted you because of it? "At www.electronicperiodic.com are all the possible download/podcatcher options for the prospective listener, including one-click links to all the majors. 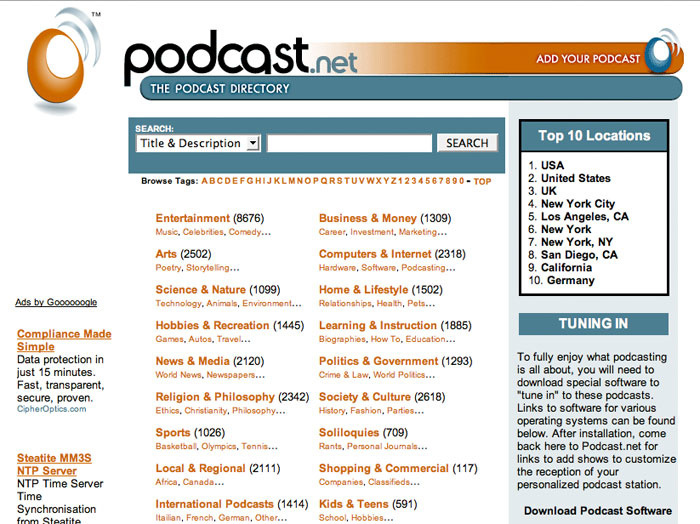 Most popular by far is iTunes: a quick keyword search on 'electronic' in the pocast directory should do the trick. 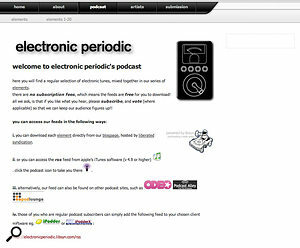 Electronic Periodic has approximately 50,000 subscribers, and this number increases incrementally with each new show. "I've had a number of independent film-makers get in touch regarding licensing music from bands, and independent labels and radio stations wanting more info on artists. My favourite feedback is from listeners; so far I've been told shows have helped someone decorate a house, kept a newborn baby calm, motivated an animator on a major film, and were solace for a guy inputting data for an ice survey in the northern territories!" Ian Duncan, the man behind the Electronic Periodic podcast.Do you have any tips for prospective podcasters? "There are a lot of podcasts out there now, and I think to make a successful show you need to be original. If you do something a little different and maintain a high quality of production, the downloads will come." What do you think of the podcasting phenomenon in general? How significant is it for musicians? "Podcasting, even at this early stage, has started a new era of promotion for just about anything: music, films, blogs, magazines. It's a great vehicle for independent artists. I still find it difficult to comprehend that once music or video is part of a podcast, it's available worldwide within seconds, with a guaranteed audience from an ever-increasing number of subscribers. Musicians with or without record-company support can reach thousands of listeners — a valuable marketing tool. "It could certainly give traditional TV and radio a run for its money. Maybe that explains the mad rush of mainstream broadcasters getting their podcasts out and plugging them to get in the top spots. There's been a shift in the podcast ranking since broadcasters became savvy and started using large-scale promotion to their existing listener base. "But there is still potential for a new independent movement of podcasters to compete by podcasting something different from the mainstream. With a long list of unique, ungoverned shows, musicians can get their music out easily, giving people a choice of material to listen to at their leisure. "Personally, I'm not a big fan of the endless chatter of breakfast shows first thing in the morning, I just want to hear some music that will help the commute go a little easier. Now I can customise my own playlists to suit pretty much any interest, without having to flick through formatted radio shows for the chance of an uninterrupted tune." Do you have plans for other podcasts? "None at present. Electronic Periodic has a long way to go, and I want to focus on that for now. "It will be interesting to see technology change podcasting. Currently it relies on an Internet connection to access shows. With wireless bandwidth getting faster, and connections covering whole cities, if (or when) manufacturers add wireless ports to their iPods and MP3 players (Sony's PSP already has this option), it would let listeners select shows anywhere — just like radio, but on demand." Flash TV: "Excellent animation podcast." Space Music: "Ambient music mixes, hosted by TC. The man has entertained us all for a long time. I believe he has stopped the cast now, but you can still get the old episodes." French For Beginners ­ The French Ecole: "Very useful way of learning the language." SOS readers who would like to submit music to be considered for Electronic Periodic should go to www.electronicperiodic.com/submission/submission.html, where they can find all the information they need. Convert your audio file to a format that portable players can download and play (most commonly, MP3). Use the integrated file-conversion features of most audio-editing applications to do this, or use free software such as Apple's iTunes. You should also add your ID3 tags. These, if you're not sure, are just the Name, Artist and Album (etc) information that shows up as your audio file's label. Just use the Name field for your episode title (for example, Show 16: Walrus Songs), the Artist field for the show title (say, 'The Walrus Report'), the Album field for your show's website (walrusreport.org), and the Comments section for any additional information and a summary of this episode. Create the RSS information necessary for subscriptions to your show. If you've never worked with a programming language like XML, don't worry — there are many applications and services available to help you in the RSS creation process. 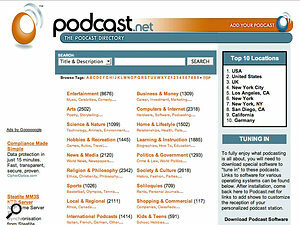 Services such a FeedBurner.com (see the 'Podcasting Resources' box) can create your feed information, test for feed compatibility and track how many people are tuning into your show. Libsyn.com, for a nominal fee each month, offers a simple web-based interface. All you have to do is fill in some basic information, use their form to upload your file and you're done! All the necessary RSS work is done for you and you can even host your files on their server and submit your work for the iTunes directory at the same time. If you're an adventurous type you can create the RSS information yourself, which provides more flexibility and power with respect to the accompanying information included with your podcast. Find a web host for your podcast. One major consideration when it comes to hosting your podcast is bandwidth: even data-compressed MP3 audio files can be quite large. You will not only need enough storage space from your hosting service to post the file itself, but will also need to consider how many times you think that file will be downloaded. Hosting services typically charge for both storage space and, more importantly to podcasters, bandwidth. If you gain hundreds of listeners, that same audio file will be downloaded from your host hundreds of times, which increases your bandwidth bill. Think about this: with a 10MB show once a week and only 100 listeners you'll eat up 1000MB of bandwidth (10MB x 100 listeners). If the following week word gets out and you get 100 new subscribers that's 2000MB (10MB x 200 total subscribers). Maybe your new subscribers want to listen to the older show they missed: that's another 1000MB. As you can see you're already up to 4000MB of bandwidth for the month and you've only got 200 listeners! Podcast-specific hosting services also include podcast-friendly features such as integrated RSS feed generation, download tracking and other tools to help you get started, but are typically more expensive than a general web-hosting service. Price is an obvious issue, but also consider your web-hosting service's customer support options. Many less expensive services do not offer telephone technical support, or offer it only at an additional charge. 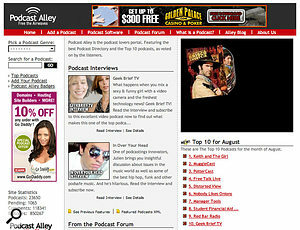 Podcast Alley is just one of the many web podcast directories that make it simple to get a podcast out there where it can be heard. Get listed. There are hundreds of podcast directories on the web where you can find shows to subscribe to and list your own show as well. Getting your podcast listed in these directories is as easy as filling in an online form and submitting the URL link to your RSS feed. 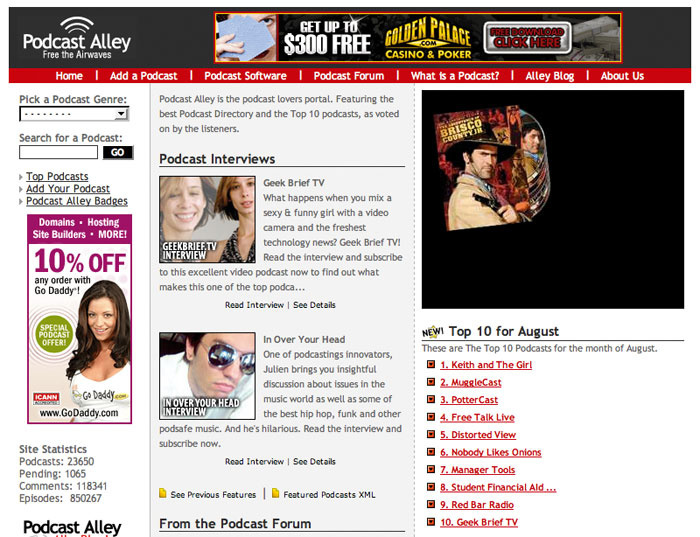 Some of the most popular directories are Itunes, Podcast Alley (www.Podcastalley.com) and Podcast Pickle (www.Podcastpickle.com). Make some money. Most people want to make money with their podcasts but the reality is that most don't. Most podcasts are free for listeners, but clever podcasters are finding ways to fund their shows. One option is to sell audio advertisements in your show, just like traditional radio. If your show develops a dedicated following you can also sell anything from T-shirts to mugs with your show logo. For musicians, podcast shows can be a great promotional tool for selling their music. Currently there's no easy way to set up paid subscriptions to podcast shows. Not all aggregators support secure connections, so you'd not only need to convince your listeners they should pay for your show, among the thousands of free options, you'd also have to persuade them to use a particular aggregator just to subscribe! Podcasters have tried to get around this by only giving out the URL of the RSS feed to those that have paid a fee. Unfortunately, this method has no security, as the URL is nothing more than a link that can be easily posted to a website or shared with friends. With only the most basic digital audio tools, anyone can create their own podcasts, and any subject can become an educational, inspiring or just plain fun experience. If you're a reader of Sound On Sound you probably already have most or all of the necessary equipment and the skills to use it. So what are you waiting for? Great sound is only half of a great podcast: content is extremely important too. Engaging your listeners is paramount in establishing and maintaining your listener base. To maintain variety, consider adding regular guests to your show. You can integrate these new voices in different ways, depending on your personal style. Adding one-to-one interviews, round-table discussions and on-location special-event interviews can be a great way of expanding your podcast's scope and fun factor. One key and sometimes overlooked issue is that podcasting does not include video or any other form of visual clues for your audience. While this may seem painfully obvious, it's only human nature to forget it when you are in the middle of a conversation. You have to create a visual experience through your storytelling, so instead of saying (for example) "Wow... what a cool looking car", think about describing the car and creating a visual impression for your listeners. When interviewing expert guests, don't hesitate to ask them to be more descriptive, and add your own visual clues if needed. 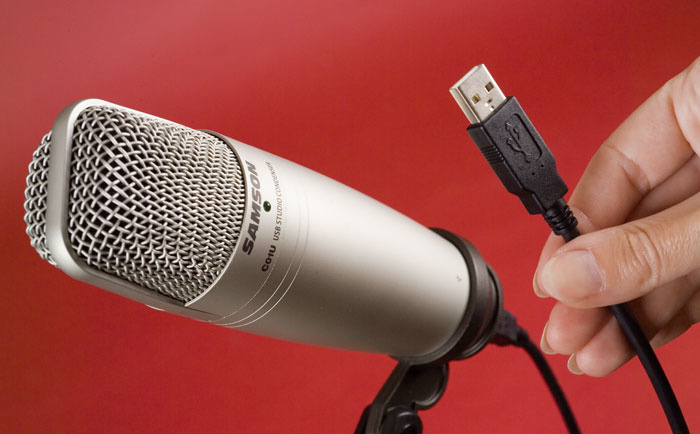 A USB mic such as Samson's C01U keeps things simple for spoken-word recording. The majority of people with a computer-based music studio have enough gear to put together a podcast of one kind or another. You can assemble your show using the standard audio recording and editing features in any of the main audio packages, such as Logic, Live or Pro Tools LE. Podcasts with purely musical content are the easiest shows to create. Assuming that you have the rights to use the music, you can just import the tracks into your audio software of choice, trim the start and end points, and add crossfades as you see fit. Most packages have plug-ins that you can use to EQ, compress and maximise the show if needed (more on this in a minute). Things get more complicated if you want to record a voice-over (presenter). Professional voice-over facilities tend to use expensive mics, such as the Neumann U47 or Sennheiser 416, and small, dead recording booths. However, if you already have a studio condenser mic that you use for vocals, you can get perfectly adequate results. Even inexpensive condensers such as Samson's C01 (which is also available as a C01U USB version) will get you started for as little as £50 plus the cost of a pop shield. More importantly, you need to find a quiet and acoustically dead location to do the recording in (a few duvets hung in the recording area, along the lines often suggested by Paul White and Hugh Robjohns in our 'Studio SOS' series, could help here). An even more cost-effective option is something like the well-regarded Plantronics DSP500 USB headset mic, which is so cheap that the creators of one successful podcast ship them to guest interviewees. Another option is a good USB headset mic, which will save the cost of a mic preamp or audio interface with mic inputs if you don't already have one. The successful This Week In Tech podcast swears by the Plantronics DSP500 and ships them to any guests who will be appearing on the show. USB mics are easy to use in any software, so you can record conversations or interviews conducted over Skype or iChat. One thing you'll notice when you try to record your own voice-over is that there's a reason why professional VO artists and presenters are well paid. Most of us sound amateurish and unnatural when recording a voice-over. Fortunately, this quality can be part of the charm of the medium (check out Stuff magazine's podcast, for example). 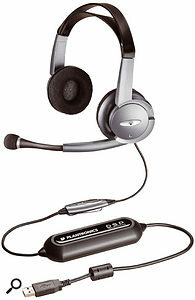 Headset mics help with spoken performance, as they keep the mic in a consistent, close position. Levels and EQ: Unlike radio, there are no real standards in place yet for the level and dynamic range of a podcast: the best thing to do is listen to radio shows and podcasts that you like and try to match them. Try to keep the level consistent throughout, using level automation, and don't be afraid of a healthy dose of compression or maximisation. Mastering plug-ins are very useful across the whole mix. The Chapter Tool utility (shown here with its graphic interface) allows enhanced podcasts containing chapters, pictures and links to AAC files to be created.Listen to your show on ear-buds and on computer speakers. You will probably find that you need to roll off quite a lot of bass: use a 12dB/octave high-pass filter to roll off below about 100Hz, which will remove a lot of breath noise, pops and bumps. Voice recordings can also be helped a lot with EQ and compression. You can remove a lot of room 'boxiness' by cutting quite hard at around 350-500Hz (precisely where depends on your room). Also try a wide gentle cut around 1kHz and a boost at about 4kHz to improve clarity. Enhanced Podcasts: Adding chapters, pictures, and links to AAC files, to create an 'enhanced' podcast, is easy if you have GarageBand. Otherwise, you will need a utility such as Chapter Tool. This Apple utility has a command-line interface, but you can also download a graphical interface for it, called ChapterToolMe, allowing you to simply drag pictures into a chapter list (see the screenshot on the left).